Home > Shop By Brand > BLACKFIRE Pro Detailers Choice Car Care Products > BLACKFIRE Water Spot Remover 32 oz. BLACKFIRE Water Spot Remover 32 oz. Make sure no spots interrupt your car’s shine! 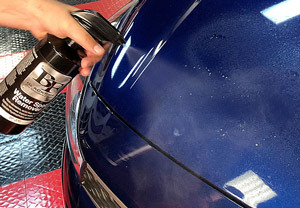 BLACKFIRE Water Spot Remover works to effortlessly break down the mineral deposits on your paint that cause water spots. BLACKFIRE Water Spot Remover is made using a safe formula that does not contain any acids or abrasives that could harm your paint, no matter what type of paint it is! Not only will BLACKFIRE Water Spot Remover get rid of the spots, it will also prevent them from occurring in the future thanks to the hydrophobic layer of protection it leaves behind. Having to deal with water spots on a daily basis is a big enough pain to make any detailer or enthusiast rip out their sprinkler system and wrap their car in saran-wrap. But, unfortunately, as long as rain is an important part of the continuation of our planet, we are forced to deal with these pesky little spots day-in, day-out. However, while they are unavoidable, cleaning them off and protecting your car as best as you can just got a bit easier! We call these pests “water-spots”, but they are actually not water. They are simply the clumps of minerals that were contained within your water that were left behind after the water had all evaporated. These minerals form a strong bound both to each other and your paint, making removing them very difficult. BLACKFIRE Water Spot Remover makes this removal process much easier by using a non-abrasive, acid-free formula that breaks down these minerals. Once they are broken down, the bonds are broken as well. This makes them extremely easy to harmlessly and easily to wipe them away! There are many products on the market that promise to do the same job as BLACKFIRE Water Spot Remover. Many of them are just as effective, but almost all of them share one aspect with each other that they don’t share with BLACKFIRE Water Spot Remover. Those other mineral removers are formulated using either strong acids, dangerous abrasives, or worse extremely strong acids. These substances are extraordinarily dangerous and will cause permanent damage to your paint if you are not extremely careful. BLACKFIRE Water Spot Remover however, does not contain any of these dangerous substances, meaning you can rest assured that your paint is always being taken care of! Removing fresh water spots using BLACKFIRE Water Spot Remover is as easy as spray, wipe, and walk away! Don't forget - in addition to your paint having no more water spots, there is also a layer of protection left behind! As if cleaning of the water spots fast weren’t enough for BLACKFIRE Water Spot Remover to be on your list of must haves, the fact that it will also protect you from the risks of water spots by instilling a hydrophobic layer of protection after you have used it! Water Spot Remover is recommended for the removal of fresh water-spots. Water Spot Remover should only be applied out of direct sunlight to dry paint that is cool to the touch. 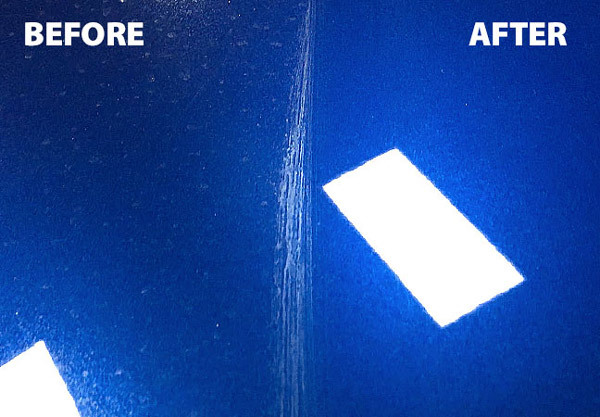 Working one panel at a time, spray Water Spot Remover directly onto the surface of your car. 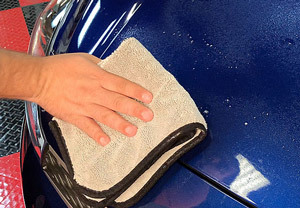 Using a clean and dry microfiber towel, wipe Water Spot Remover off the surface. Continue around vehicle. BLACKFIRE Water Spot Remover 128 oz. Great product. We have Hard Water, which causes those nasty water spots on freshly washed vehicles. Blackfire took them right off. ProsNice size bottle, not one of those little 5oz bottle.